We had mentioned the great views from Route 464 leaving Many Glacier in Glacier National Park. This is a panorama from a high viewpoint that we missed on the way in. Beautiful views, but very few places to pull over for pictures. 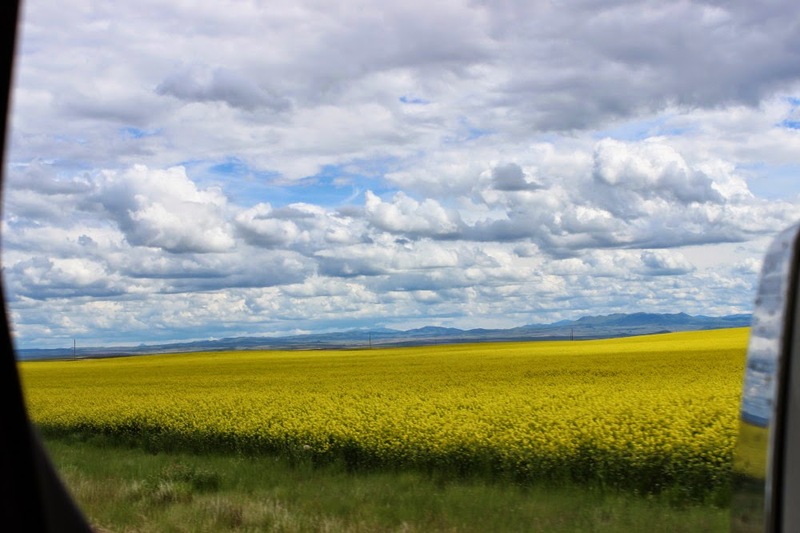 Following Route 2 towards the east, we see many fields of bright yellow. The best answer so far, indicates fields of Canola--for Canola Oil. 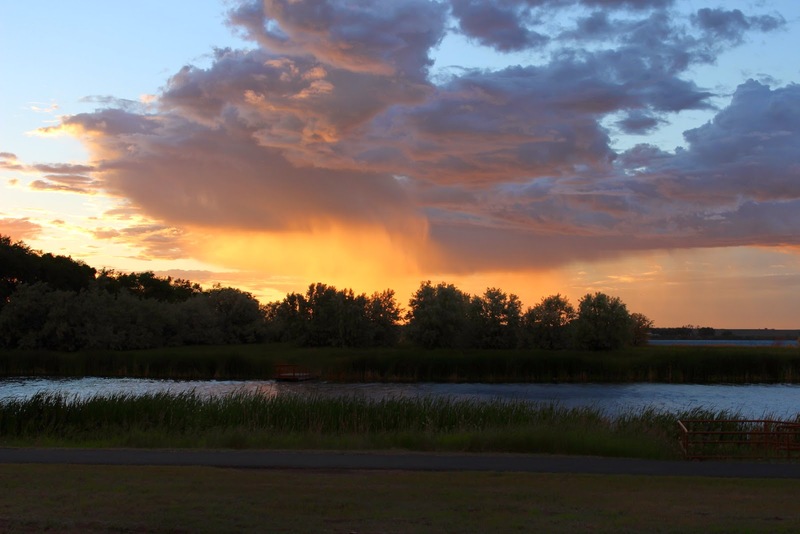 About 65 miles south of Saskatchewan , Canada is Fort Peck Dam and Fort Peck Corps of Engineer Campground in Glasgow, Montana. On the weekend and there are no spaces left. Oh yes, one camper has just left. We are quite lucky this time. A view from our site. 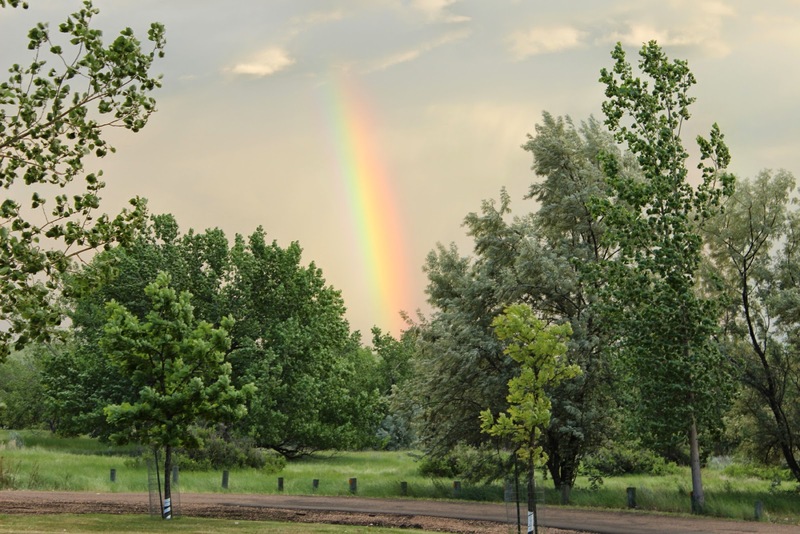 The campground is bird friendly and also was a scene for a short but great rainbow. Part of the Dam is this great Visitors Center. 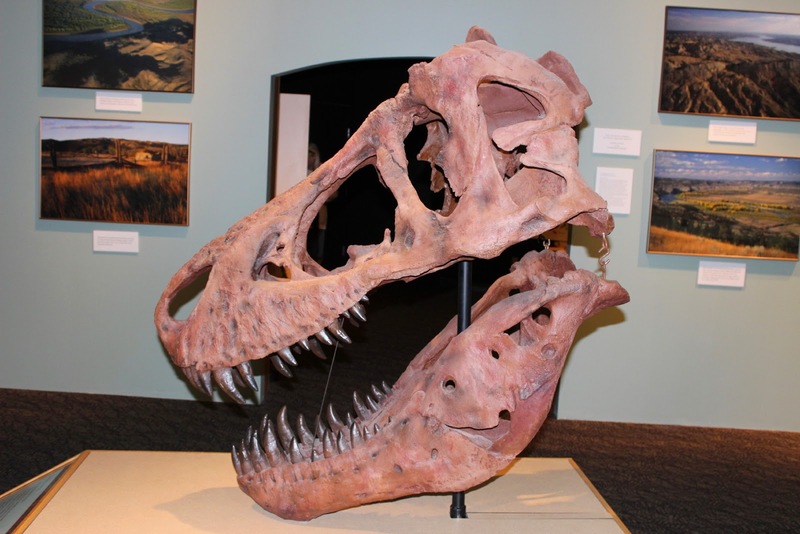 There is a good section on the fossils found near here and other parts of Montana. 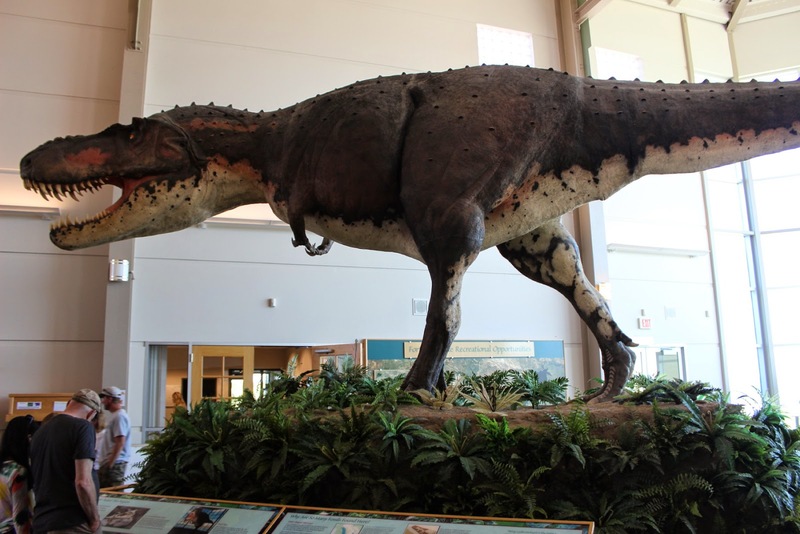 This large guy is a copy from a Tyrannosaurus skeleton found in the 1990's about 20 miles from here. The bones themselves are fragile, but this skull was copied from the original. 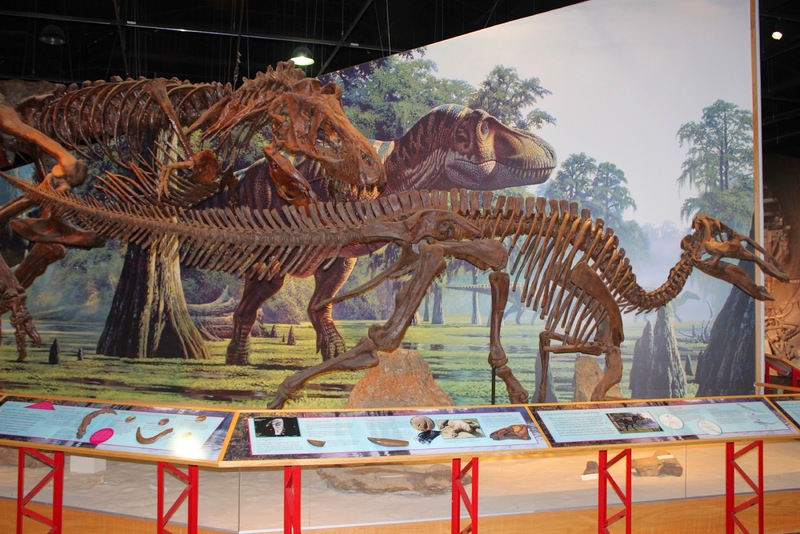 One of the things about this 1990's discovery was that many of the bones were still intact. Some good displays being enjoyed by many families here for the beginning of summer. By the way, we did not know that so many dinosaurs were here. Evidently, millions of years ago the US was divided by a large body of water from the Gulf all the way into Canada. It made for a tropical type of environment back then. 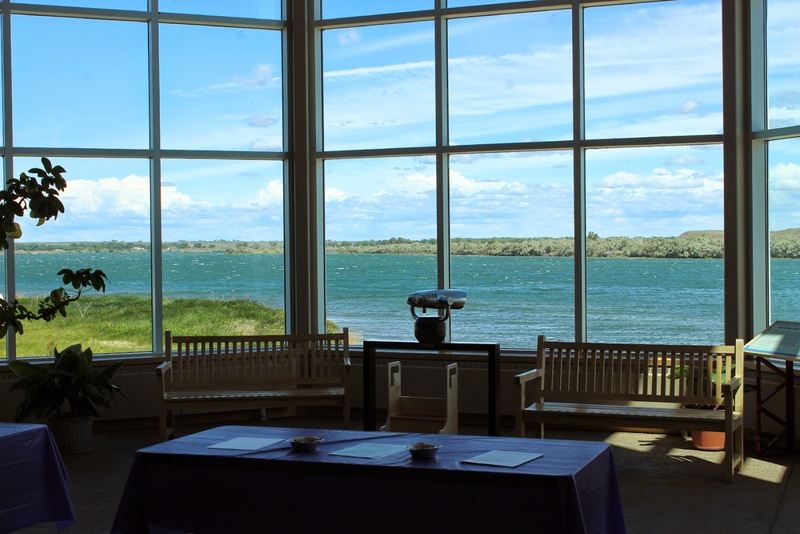 The view from the large windows is right to the Missouri River. It's hard to see the dam( to the right) because it is an earthen dam. 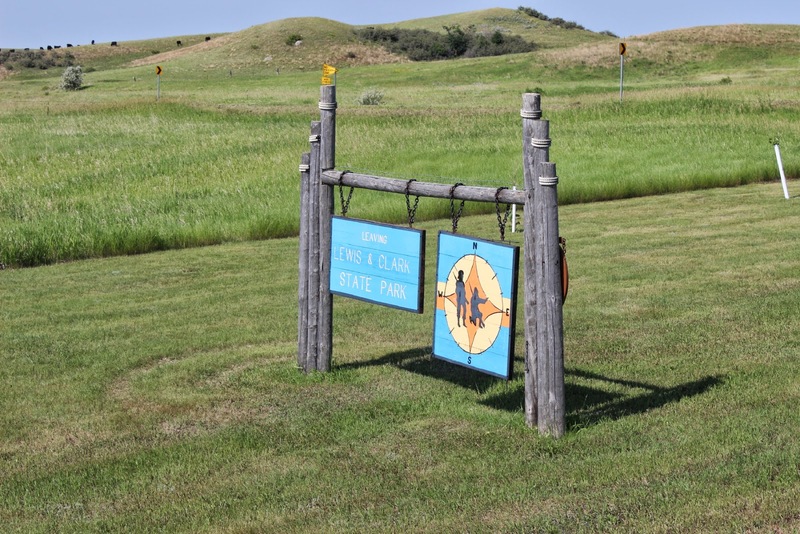 A plaque here indicates that if all the men, women, and children of Montana now about 990,000,lived in an area the size of Fort Peck Lake ,they would each have about a quarter of an acre lot. It is appropriate to mention here that in this part of Montana , as well as many parts of North Dakota, you can go for many, many miles seeing more cattle than people. This is a view back towards the electric generating towers at the dam. The lake is on the other side of the hill behind. After Fort Peck, Jan and I cross into North Dakota and the Central Time Zone. 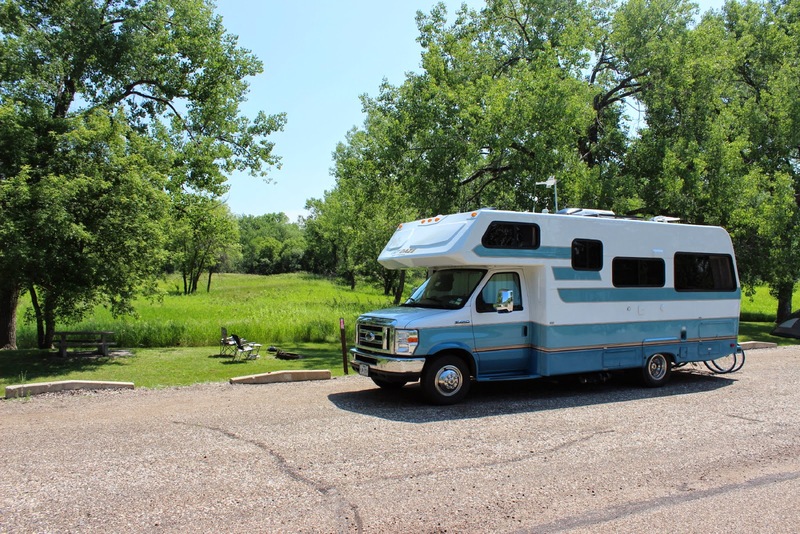 Still following the Missouri River and the Lewis and Clark Trail, the next stop is at Lewis and Clark State Park on the Missouri. From Williston, we are now following the Missouri river on a smaller road, Route 1804(significant date for Lewis and Clark). While smaller, the road is posted at 70MPH with many oil field trucks barreling through. Not much other traffic, however. This is what you will see dotting the large fields all along this route. 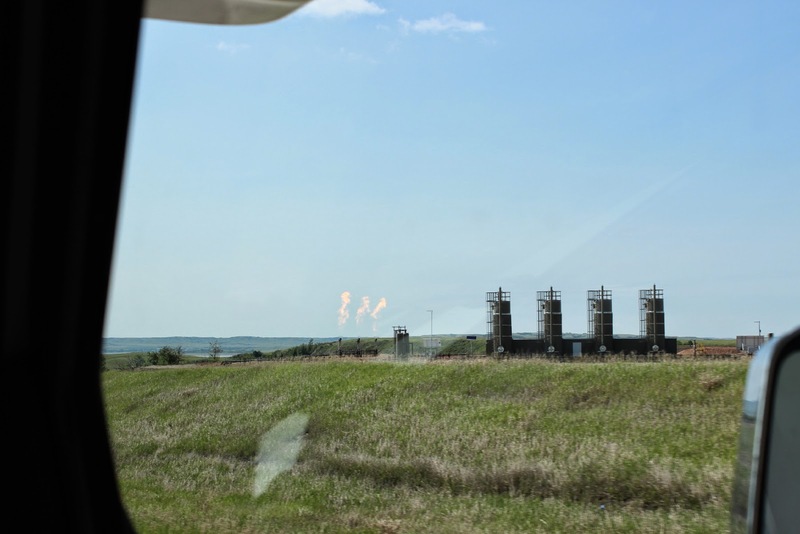 The new oil production from shale. We saw many, many of these. On the left you see the huge flames from the propane that is being burned off. There have been articles recently about how many gallons of propane are being wasted this way. Evidently there is no easy way right now to capture the propane. Following the Missouri brings us to Downstream Campground. 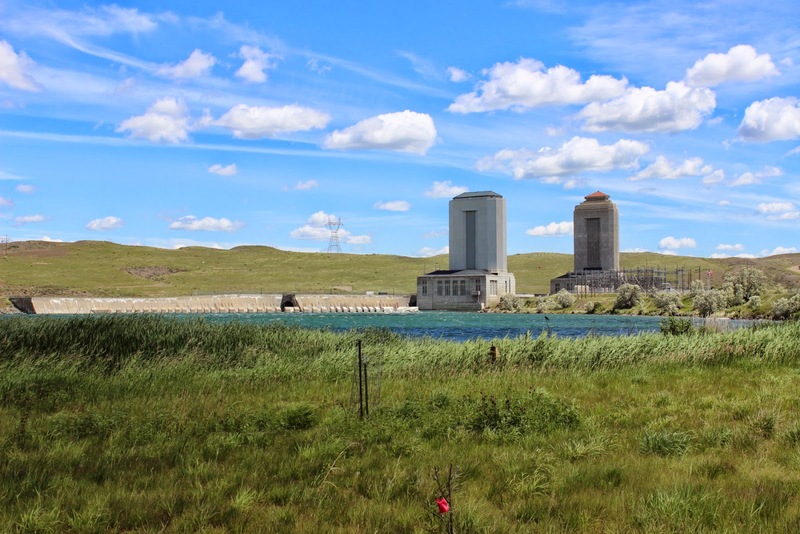 This is another Corps of Engineer Park , part of the Garrison Dam project on Lake Sakakawea. Besides The Corps park, there are two state parks on the lake. 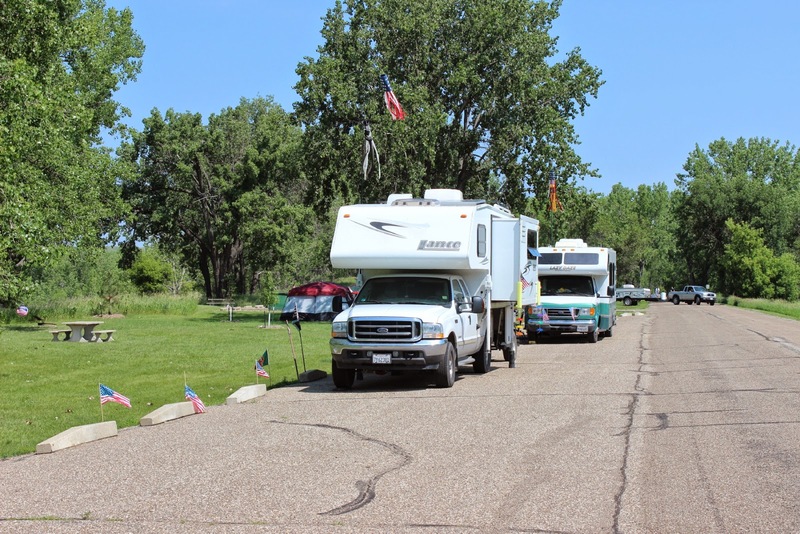 This is part of 4th of July week and weekend, so, without reservations, we are lucky to pick up a dry camping site with a nice view of the Missouri River on one side and a wildlife preservation on this side. All this is tough sledding for $6 per night. (Just kidding about tough sledding--a very comfortable site.). If you travel this way, it is worth going out of your way. The sites in the three main loops have electric and well spaced with super green lawns and trees. The main cost for those sites is $18 per night. 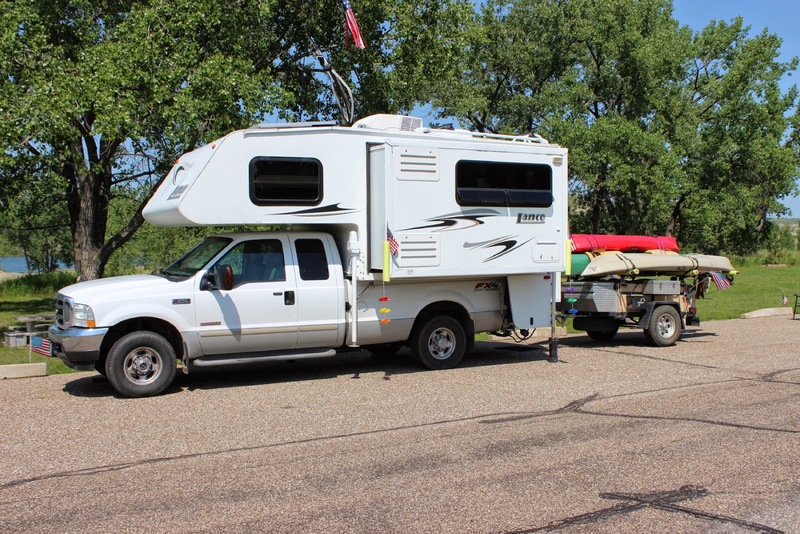 No antiques this time, but this might be a great unit for those fishermen and kayakers who want a unit that can get to all the fishing holes and still be comfortable. Note, they are traveling with a Lazy Daze---from California. This is the mighty Missouri from our campground. When you drive through this northern section of North Dakota, you drive through huge farm after farm. That is dotted only by a few beautiful farm houses(many red) and many grain elevators or silos. 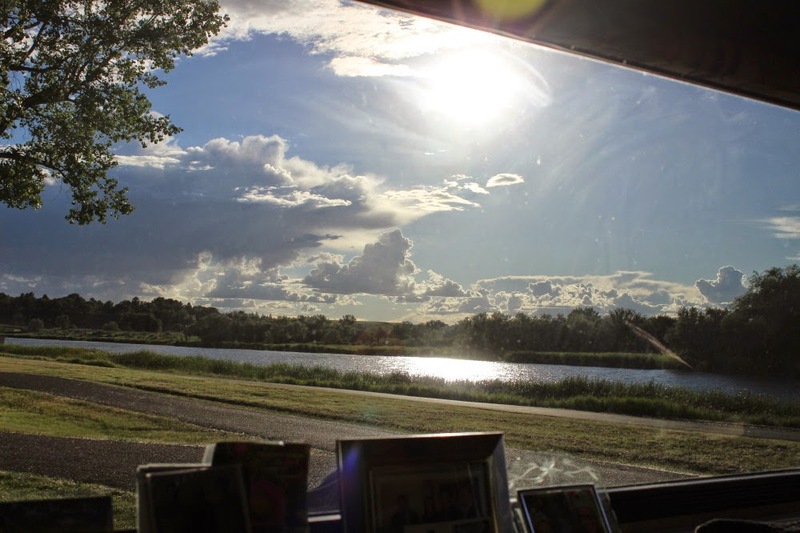 We think that this makes the residents very eager to find vacation spots such as Lake Sakakawea, or others along the Missouri.